A RESIDENT from Bishopston has put together a proposal to provide a commuter service from Portishead to Bristol. During the morning rush hour a large number of people commute from Portishead to work in Bristol, resulting in a large amount of traffic. The current plan is to reopen the old Portishead railway line to passenger trains as part of the MetroWest project, which still requires £47m of funding. Barry Cash has a proposal for a bus commuter service that uses STRAIL, a system of thick interlocking panels made from rubber that fit between and beside railway lines. 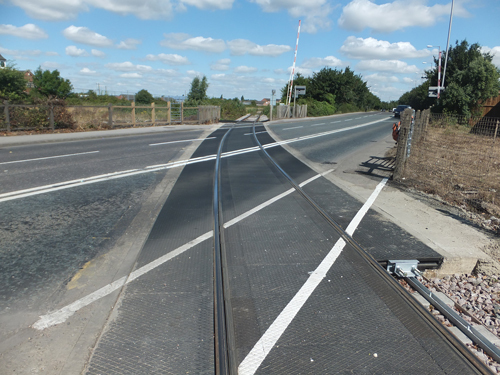 They are in use at 30,000 locations on five continents to provide level crossings for road traffic to drive over railways, and Barry says they have been used for 40 years. Barry is proposing that a service could run from Portishead to Bristol during the morning rush hour and from Bristol to Portishead in the evening rush hour. According to Barry, the main advantages of his system are that it would be cheaper than reopening the railway (estimated to cost £40m as opposed to as much as £175m), it would provide a more extensive route, it would not interfere with the current use of the railway for freight trains (with only 10 a week running at present), and there is also the possibility of adding an off-road cycle track that is 4kms shorter than the present route. Speaking about his proposal, Barry said: “I’ve always had an interest in transport as it’s a key issue in Bristol. I came across STRAIL and thought it would provide a much better solution going forward. I looked into it and contacted STRAIL direct to find out more, and after doing a back of envelope calculation, it appeared to offer a cheaper solution than what the council was proposing, so I decided put together a proposal. Barry presented his proposal to the council at the full council meeting on December 11, and at the time of writing he had not received any response to this.